Gigabot is, of course, my favorite 3D printer. But it all started with the kickstarter campaign for Printrbot – so props to Brook Dunn and his team! What makes 3D printing cool…..hmmm, everything is pretty cool when it comes to 3D printing. This post is more about 3D printing generally. It’s a great technology that has finally advanced to a stage that the serious makers/tinkerers…and some of the casual makers or tinkerers…can enjoy creating tangibles on their own printer. Where can you get one today? I just helped a friend pick out a printer for his small business. We contacted Josh Pearce at Michigan Technical University and looked at the Make Magazine review of 3D printers for 2014. There are so many options to choose from that it makes my head spin. If I needed to purchase a 3D printer today, these are some of the things I would think about:While a small build volume doesn’t seem like an issue when you first start, it really does limit your options over time. I’ve found that we want to print lots of things and printing larger objects is more fun, generally, than smaller objects. 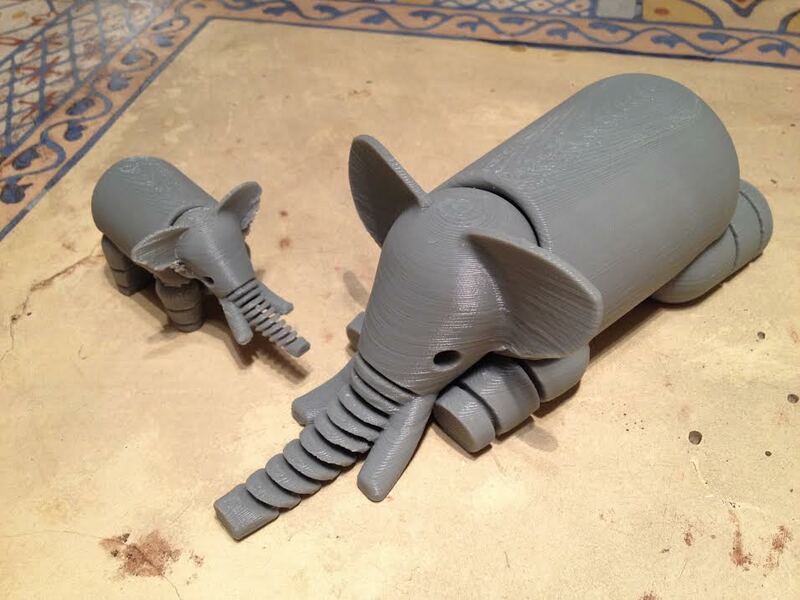 It’s best when you can print a whole set of objects in different sizes and colors…like our Elephants! Size matters! There, I said it. Get the biggest build volume you can, balancing other factors into the mix of course. User community matters – make sure that you look to see whether or not other folks are using and talking about their printing experiences for the bot that you choose. Many of the start-up 3D printers for personal use are overwhelmed by the drivers of a new business. While the founders and staff of the start-up have great intentions, they are in the midst of an entrepreneurial tsunami and may not be able to respond when you have a problem. That’s where the community of users can bridge the gap. If other folks are actively using their printer and sharing experiences online, there is a good chance that you can connect with someone that has either already solved an issue and/or can troubleshoot with you to find a solution if/when you hit a snag. Let’s face it, you can buy a printer for a few hundred dollars or several hundred thousand dollars. Do what your budget will allow. But buyer beware – 3D printing is a great hobby that takes time. This is not a gadget for instant gratification. It’s an adventure over time that unfolds as you explore and use your printer to create cool objects – well worth the effort in my opinion, but a commitment nonetheless. **3D printing is changing like lightening. These are just the printers that I’ve got experience using and/or interacting with their team. There are many options – these are my first picks from my own experiences (be aware that I helped start re:3D and have a Gigabot in my garage now, I supported the @printrbot kickstarter, and have talked with academic colleagues in the field of 3d printing about @Lulzbot – plus the Lulzbot folks have been really helpful AND they are in Colorado – lots to like there. The point is that these are the printers I’ve had contact with and I am making no claims about brand neutrality). I suggest looking at the Make magazine review and exploring forums with people in the know about the state of the marketplace. Think about what you need and there is probably a 3D printing bot for you.